Twirlips are enemies that appear Super Mario Galaxy 2. Their name is a combination of the words twirl, describing their motion, and tulip, describing their appearance, which resembles that of real-world tulips. At first glance, they appear as white bud shaped creatures that resemble onions with two beady eyes. To attack, they turn into a pink flower with a yellow center and quickly spin around the area like a drill. They do this from time to time. In their flower form, Twirlips can only be damaged by stomping on their heads. In their bud form, Mario or Luigi can use any attack method to defeat them. 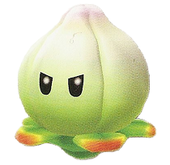 Yoshi can also eat a Twirlip but only while it is in bud form. They appear in a few galaxies, and are also fought on some Bonus Planets. In their flower form, Twirlips can actually defeat another Twirlip when the latter is stopped by a Co-Star Luma and the two Twirlips collide. Furamī From the English word "flower". ↑ Browne, Catherine. 2010. Super Mario Galaxy 2 Prima Premiere Edition guide. Page 30. This page was last edited on February 4, 2019, at 22:34.